J&A performed land surveying, civil engineering design and preparation of construction plans for widening of an existing 2 lane road (approximately 4000 lf) to a 5 lane section with curb and gutter. Project was performed on a “fast track” schedule in 3 month time frame at the request of the client. Close and early coordination with ALDOT allowed us to obtain a permit for utilities relocation across a state highway within the project schedule. The project was located within the jurisdictional limits of 3 separate governmental entities, requiring coordination of right-of-way acquisition and construction with each. Additional tasks included: plans and permitting for new Signalization of a state highway intersection, coordination of Utilities Relocation, limited Environmental Studies, and preparation of legal descriptions and R.O.W. acquisition drawings. 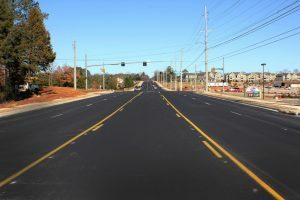 J&A performed land surveying, civil engineering design and preparation of construction plans for improvements and realignment of 2 intersecting city streets, including widening to 5 lanes, and Construction Plans for two new 5-lane Bridges, channel widening of an existing creek, and new signalization. Additional tasks included: utilities relocation coordination, preparation of legal descriptions and R.O.W. acquisition drawings, and preparation of an environmental assessment document. Total length of project: 1.7 miles. J&A performed land surveying, civil engineering design and preparation of construction plans for widening of an existing 2 lane rural roadway (approximately 3 miles) to a 5 lane urban section with curb and gutter, bike lanes, and sidewalks. This roadway is a primary gateway into a newly annexed area of 9000 acre, which includes a 2000 acre industrial ‘mega-site’ for future development. Additional tasks included: limited environmental studies, preparation of legal descriptions and R.O.W. acquisition drawings, coordination of geotechnical studies and utilities relocation. J&A performed land surveying, civil engineering design and preparation of construction plans for improvements of an existing 2 lane road (approximately 6700 feet) including widening to a 5 lane section with curb and gutter, and bridge/culvert widening. Additional tasks included: preparation of legal descriptions and R.O.W. acquisition drawings for approximately 65 parcels, utilities relocation assistance, traffic analysis and signalized intersection design, and preparation of a Categorical Exclusion (CE) Environmental Document. 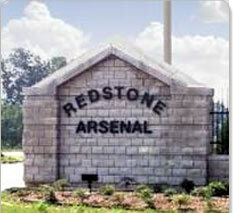 J&A performed land surveying, civil engineering design and preparation of construction plans for widening a primary access roadway (approximate length of 2.0 miles) into Redstone Arsenal by adding two new lanes to the existing two-lane roadway, extending existing culverts, and adding a new two lane bridge. Additionally, a separate plan set for utility relocation was required and bid to clear the existing utilities from the roadway construction area prior to roadway work. Maintaining the security and accessibility of the various restricted areas required unique considerations.